Piece of a slab of marble found along with the torso of a statue (60 x 38 cm). To good fortune. 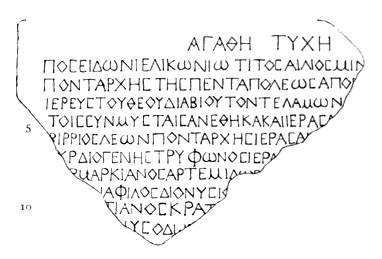 Titus Aelius Minucianus, Pontarch of Pentapolis, . . . father (?). . . and priest of the god for life dedicated the monument (telamōn) . . . and the statue (?). . . to Poseidon Helikonios (“of Helike”) for the fellow-initiates (synmystai). The following served as priests . . . of the god (?). . . : Birrios Leon, Pontarch, who served as priest, Aurelius Diogenes son of Tryphon, who served as priest, Aurelius Marcianus son of Artemidoros . . ., Aurelius Hermaphilos (?) son of Dionysios, . . . Aurelius Pontianos son of Kratinos (?), . . . Aurelius Dionysodoros (?). . .
IHistria 143: Facsimile by Weiss.